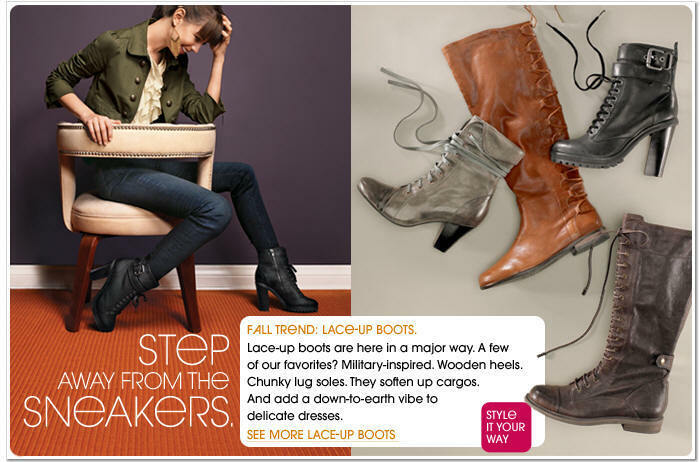 Buy women's boots at Piperlime. You will find lace up boots from Hive and Honey, Lucky Brand, Restricted, Rocket Dog, Kelsi Dagger, Miz Mooz, Kenneth Cole Reaction, Very Volatile, Betsey Johnson, Boutique 9, Joie, L.A.M.B and more. Personally, I think that the Kelsi Dagger Eva in black is rather interesting. The Kelsi Dagger Eva is described as follows: Boot Round-toe ankle boot Lace-up and belting detail 4" heel Leather lining Synthetic outsole Inside zip closure Upper: 100% leather. 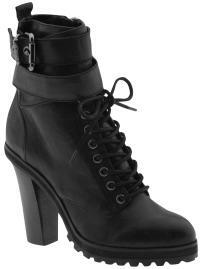 In addition to this fab lace-up boot, you will find plenty more exciting styles at Piperlime. You may also have interest in reading our Shoe Sales August to December 2010 article. You can read more shopping articles in the Men's Fashion News or Women's Fashion News sections.